This man had a tiny second fingernail growing on top of the nail of his middle finger. It looks like a second finger. 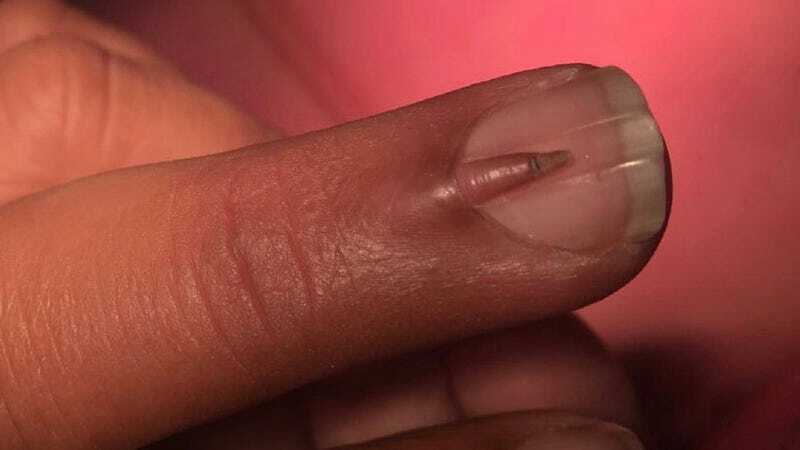 A 28-year-old man in Pakistan came to doctors with the abnormal nail growing out of his left middle finger. It hurt, and the patient thought it was ugly. The doctors took x-rays and found nothing unusual, beyond the obvious. The growth was made of keratin, the same stuff normal human fingernails are made of. Again, it was a second, tiny nail growing from his middle finger. The doctors saw it, recognized it was strange, and wrote a case report in the International Journal of Surgery Open. They removed it under anesthesia. There have been several other cases of these auxiliary nails, especially in the case of toenails. It’s genetic, but normally people aren’t bothered by it, they write. One recent paper noted that second pinky toenails are common across the world. The authors of the new paper point out that the specific nail they found, an extra nail on top of a middle finger’s fingernail, is rare. I get the nail was probably uncomfortable. But wouldn’t it be sick to give someone a super middle finger like this?